Why is this more expensive as the Arduino Pro Mini 328 for whatâs effectively the same thing? Mostly because it's made by Arduino and needs to be shipped from their factory to us before we send it on to you. Every step in the supply chain adds cost to a product. The Pro Mini is made right here at SparkFun so we're able to charge less for it. You know what be perfect for this? A socket to plug it into. Something that could be soldered to strip board. That way you can take right from the breadboard to the strip board. By the top and bottom rows of pads, you can see this is a 0.6" width board, so I guess a 24-pin DIP socket is compatible with it. I don't have one but I assume those rows (TX RX 5V & A4 A5 5V ground) are spaced 0.1"
What I wonder is how close Arduino/Sparkfun are to having a DIP sized arduino. The capacitors required for decoupling are too big to fit inside a DIP package - this product is probably the closest you'll get. Though you could just use an ATMega DIP or similar microcontroller if you can live without USB. Not that it matters to me... Ill stick to the PIC line. A DIP package is "0.600 in width or ".300 . So we would be shooting for the "0.600 . I guess all they could do is mount things on both sides. Or really tighten things up, so that you could cut off that extra ".1. But the cost may not be worth it... Its still very small. 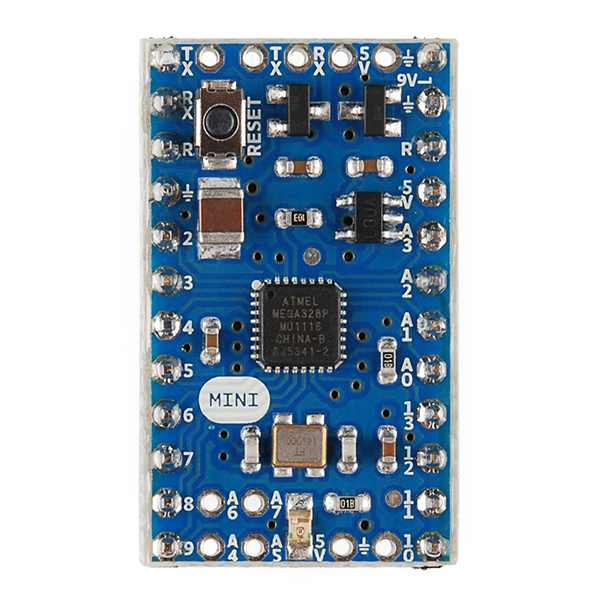 The Arduino Mini was orginally called the Arduino stamp because it takes the same format as the Basic Stamp, a double wide DIP, this was a intentional to make Basic Stamp equipment compatible with arduino equipment, more or less. Hi, is the mini 5 supplied with a crystal or with a resonator? Crystal ( Crystal + 2 external caps). In the images, check out the silverish component with a golden outline, with two white parts to the left and right of it. That's the crystal + caps). Does this run at 5v and 3.3v or is it one or the other? It's actually only one: 5V. 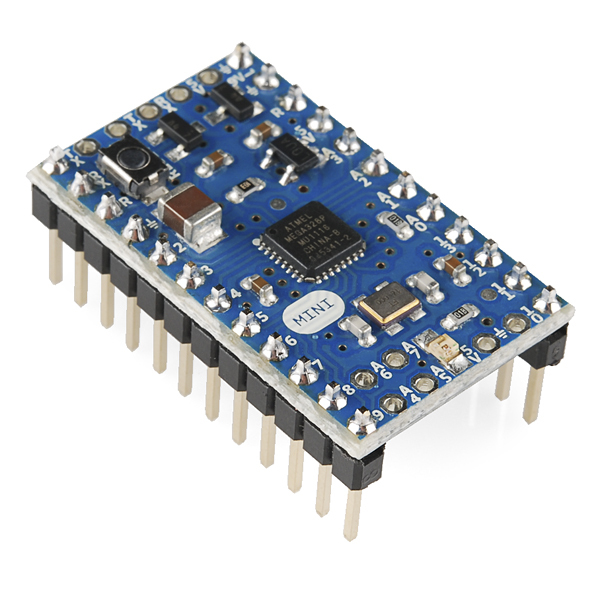 It uses the LP2985aim5-5.0 as its voltage regulator, which has a fixed 5V output. I am a bit confused with the differences between the "Mini 05" and the "Pro Mini". The Mini is rated only at 9V input. The schematic shows that the "Pro Mini" has a 10uf cap on the raw line that the "Mini 05" does not. The regulators are similar in specification and both have up to 16V input as their operating range. If I feed the "Mini 05" 12V, will it smoke? Should I use a 9v zener to clamp the input voltage? Should I add a 10uf cap to the raw line? How can I power this safely without using another 9V supply in the project? The placement of the A4-8 pins on the 0.1 grid makes the Mini more useful to me. The other difference is a pit puzzling, though... Why is IO7 on the serial port connection end and on the side? Why not reset? 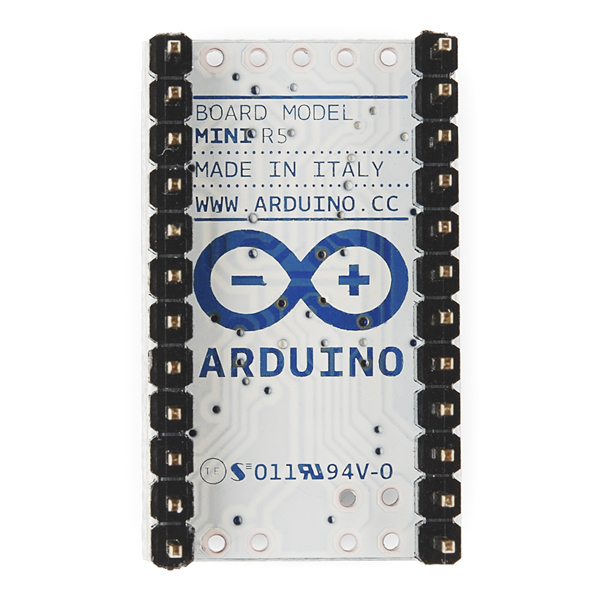 This board was designed by Arduino and not by SparkFun, so we can't say for sure why they made certain design decisions (you can ask them directly on the Arduino website). I can say that for these small regulators, you can run into thermal problems when the difference between the input and output voltage gets too high. This is why even though the maximum input is listed as 16V in the datasheet, if you try to regulate 16V down to 5V or 3.3V, the difference has to turn into heat, and the small chip will not be able to reject that much heat (the regulator has a built-in thermal shutdown, so it shouldn't permanently damage it). You should be able to run this off 12V if you're not pulling too much power through the I/O pins, but in general, keep the input voltage at least a half-volt above the output voltage (5V), but otherwise as low as practical. Does this board come with PWMs? Yes, all Arduinos have PWM outputs. So, how is this different from the Sparkfun branded Pro Mini (DEV-11113)? 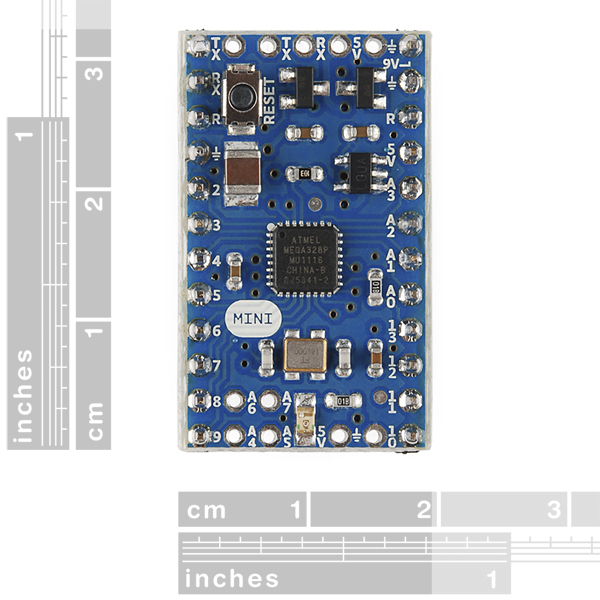 The Mini has voltage regulators and stuff built into it (the Pro doesn't). The Mini would be much easier to run off batteries (for example). It also has the header pins built in so it's much easier to stick it into a breadboard (or attach it to some perfboard). I just wanted to point out that SparkFun's Pro Minis do indeed have voltage regulators. As far as I can tell, the only differences are the footprint by .1" and the Mini Pro has the OSHW logo on it. This pinout is actually very close to directly connecting to Basic Stamp 2 boards. You would need to fiddle with the programming pins to get it to work though. And the Pro Mini comes in a 3.3V version. Are the headers soldered to the PCB? They do come soldered to the PCB, as shown in the picture.